Pastry aficionado Hannah from 8-Bit Bakery joins the roundtable this week, and she's brought plenty of goodies for The Basement Crew! From a giant cookie emblazoned with the Pete's Basement logo itself -- getting attacked by Space Invaders! to smaller specialized cookie boxes each with delicious treats made according to their own unique video game theme! Pete puts the whiskey to the side and breaks out the milk for this one! Once they've eaten their fill....they eat some more! C'mon, act like you know these guys! 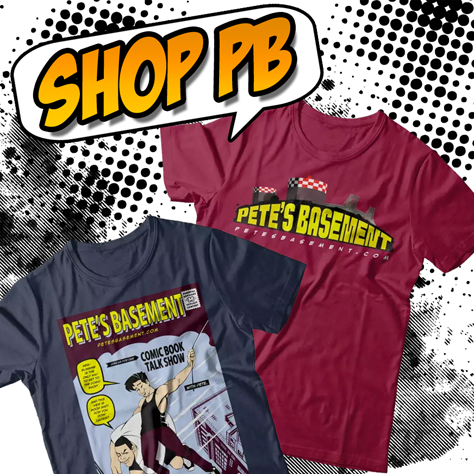 Legendary Legend of Zelda Contest Giveaway from Pete's Basement!! This contest is closed! look for the announcement on next week's show! Adamantium Subscribers get to see the announcment on Saturday! Everyone else will hear about it when the show is free on Tuesday! Good luck! Teenage Mutant Ninja Turtles is the top comic book this week and both Pete and Ramon gush over its awesomeness. The Mega Man and Sonic the Hedgehog team up concludes. Also ending: Tony Stark's pride after his hook-up with Gamora in Guardians of the Galaxy.